Obviously we don’t have electricity at the allotment so it gives me a good opportunity to bring out the non powered alternatives to power tool. I know I could use a battery drill etc but they always seem to run out of power five minutes before the end of a job. My favourite tool at the moment is my ‘Yankee Screwdriver’. This is what we used to use to quickly drive screws before the advent of the battery drill. I love using this piece of kit. It is quick, easy and never runs out of power. They do take a little bit of getting used to and you have to be careful or you can damage the piece you are working on. I slipped this week and the screwdriver went through the side of my polytunnel. Another great piece of kit is the brace and bit. This is great for boring holes in wood, especially larger holes like to ones I did to take the hoops for the tunnel. For drilling small holes like pilot holes for screws or for drilling into metal you would be better of using a hand drill. I don’t have a hand drill at the moment but I will be getting one as soon as I find one at a boot sale. I also have a selection of hand saws at the allotment. All of the saws I use at present are modern ‘hard point’ saws and cannot easily be re sharpened. I do have an old Disston panel saw but I need to learn how to sharpen a saw properly. Keeping your tools sharp is a valuable skill and one I need to learn myself. We are so used to throwing things away these days that things like sharpening drill bits or a saw are being lost which is a shame because you can pick up some real bargains at car boot sales if you know how to bring these tools back to life. Old tools tend to be well made and from higher grade materials so it makes economic sense to look out for them at car boots and learn how to look after them. 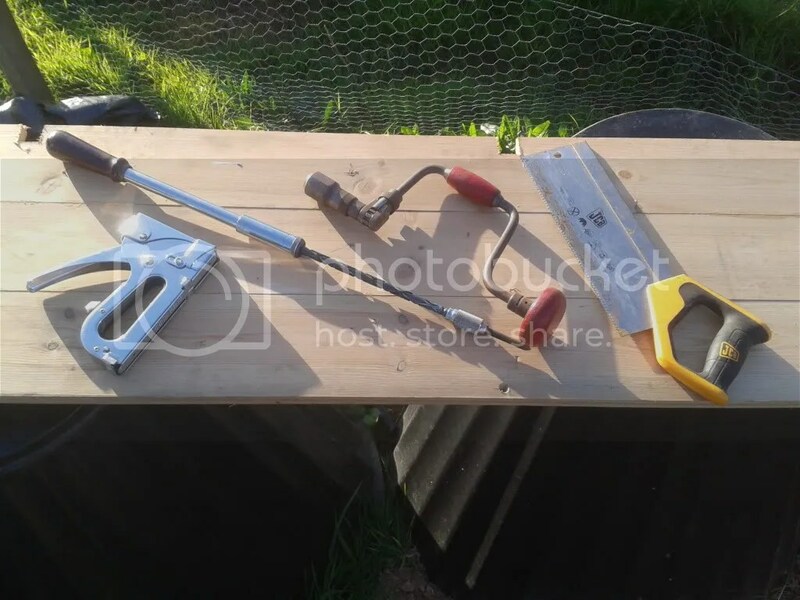 Categories: Self Reliance | Tags: Allotment, Brace and bit, Car boot sale, Disston, frugal, hand drill, hand saw, Hand tools, self reliance, Yankee Screwdriver | Permalink.